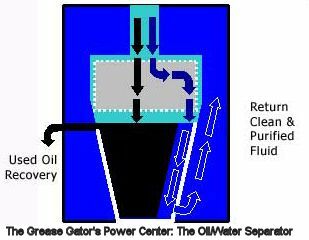 The Grease Gator's oil-water splitter purifies the cleaning solution constantly. The Grease Gator is patented technology. The Grease Gator is powerful cleaning. The Grease Gator is environmentally-friendly parts cleaning. - it eliminates 1,000 lbs. of organic waste per year per mineral spirits parts washer replaced. The Grease Gator is the first major innovation in parts washer technology in over 50 years. The Grease Gator eliminates the need for expensive fluid replacement services. The Grease Gator provides rust protection that stays with the part. Sink Details: Sill Height: 37 1/2"; 16 Gauge Stainless Steel with High Quality Finish; Sink top frame construction with radius corners for an esthetically pleasing geometry and clean seamless look; High Quality Hand TIG Welded Tank seam. ; Stainless Steel Lid Latch; Angle formed Lid Flanges for improved strength and ease of opening; Loc-Line Style Acetal Flex Nozzle; Flow Thru Cleaning Brush Assembly; Flow Regulating Valve to Direct Flow; Stainless Steel Crumb Cup with Stainless Steel Filter Strainer. << The Gatorizer - Any standard parts washer sink will fit the Gatorizer. All models include: 30 gallon Purifier Vessel; 1,500 W Digital Heating System with Precision Sensor; Digital 24 Hour Timer to Control Heater; Solution Capacity: 25 Gallon; Pump: 300 GPH, magnetic submersible; Electrical Requirements: 120V/60 Hz/20A; Electrical Control Box with Ground Fault Protection for submersible pump; Grease Gator Purification System Drum Insert with Oil Collection System. Call or send us a note (with below message form) for pricing. The Grease Gator Aqueous Cleaning Solution is specially formulated for maximum cleaning and maximum oil-water purification. Additionally, Grease Gator Anti-Rust is added to the solution to eliminate rust issues. All Grease Gator Models come with a Gator StarterPak which is enough cleaning solution and anti-rust solution for the first month of operation. Purchase additional solution by the GatorPak. 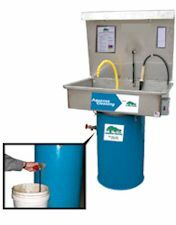 A GatorPak includes 4 gallons of Grease Gator Aqueous Cleaning Solution and 1 pint of Grease Gator Anti-Rust. We can answer any questions you may have on the innovative Grease Gator or provide pricing details. Send us a note. "Parts Cleaning, New Methods Help Reduce Costs While Improving Compliance"
by Timothy Lindsey , phD; Fixed Ops Magazine. "Cleaning oily parts gets easier, quicker and a lot cheaper"
by Mary Wisniewski; Business Reporter, Sun-Times Media. The Grease Gator Aqueous Parts Washing System eliminates these mineral spirits hazards.